ST. ALBANS, Missouri – How does one top a record-tying performance? By breaking a Championship record and tying yet another. Rose Zhang continued her dominant play during the third round of the 42nd Girls Junior PGA Championship with a 6-under 66, stretching her lead to four strokes at the Country Club of St. Albans, Lewis and Clark Course. Zhang’s three-round total of 200 breaks Kristen Gillman’s mark (202) for lowest 54-hole score in Championship history, a record Gillman set in 2014. She also tied for the lowest third-round score in Championship history, a record she shares with: Ariya Jutanugarn (2011); Lexi Thompson (2007); Angela Park (2004); Emma Cabrera-Bello (2003); Dorothy Joy Delasin (1998); and Beth Bauer (1994). 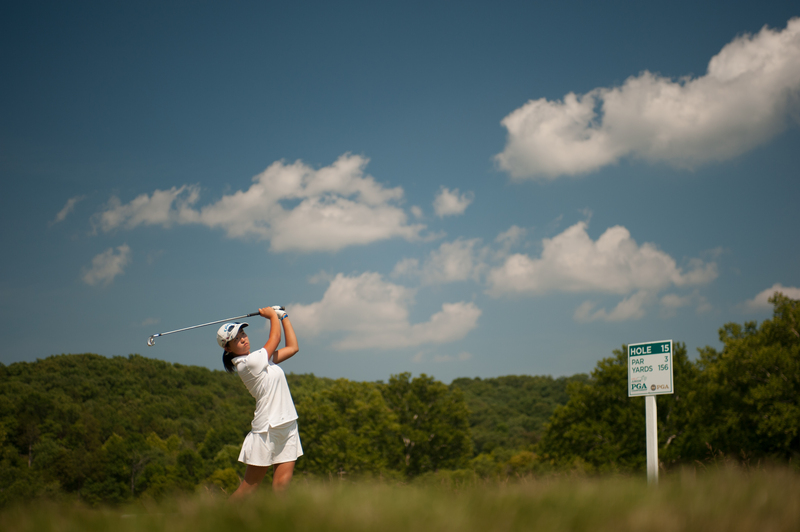 Zhang caught fire on the back nine to distance herself from the field with birdies on five of her final eight holes. Even with the sizable lead, the 14-year-old from Irvine, California, isn’t looking too far ahead. Yealimi Noh, of Concord, California, is the closest competitor to Zhang at 204 following a 2-under 70. A birdie at 18 could offer some momentum for the 15-year-old heading into the final round. Virginia Green finds herself five strokes back, but will have a chance if she can maintain her strong ball striking. The Point Clear, Alabama, resident hit every fairway in the third round and missed only one green in regulation, leading the field in both categories. After three consecutive birdies from 14 to 16, Green made just her second bogey of the Championship on 17. “I need to continue trying to play my own game and hopefully not lip out my putts,” said Green, who will be in Friday’s final grouping with Zhang and Noh. Defending Champion Lucy Li remains in the mix after she fired a 4-under 68, bringing her Championship total to 206. Her lone blemish came at the 389-yard, par-4 10th when she failed to convert a sand save. She sits in a tie for fourth with Angelina Ye and Lauren Beaudreau, who posted third round tallies of 69 and 70, respectively. Round one leader Hailee Cooper failed to find her groove on Thursday as she carded a 1-over 73. She is joined by fellow 2016 U.S. Junior Ryder Cup teammate Gina Kim in a tie for seventh at 207.